Hello lovelies, considering Mother's Day is only 11 days away, I thought it was time to get the lovely Mother's Day feature started. I've only been around a little over six months, so this is my first Mother's Day feature on Unique Young Mum. I truly believe there is something featured for each and every Mum out there, from organics to chocolates, from wine to pink champagne soap I have it covered, well nearly ;) Just bare with me and I will introduce you to some of the cutest and unique Mother's day gifts around. My own beautiful, amazing, sweet, funny and lovely Mother had announced two week's ago she is moving 4 hours away, sadly the move is happening next Saturday (the 9th), just one day before Mother's day so this year we are celebrating a week early. Mother's day is a day to spend quality time with our Mother's, to give them a day off the housework, the cooking, the tidying, Mother's day is a day to spoil our Mother's, to present them with some of the beautiful gifts around. 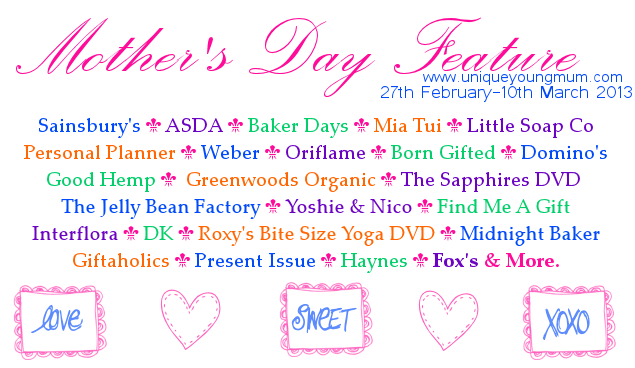 The banner above has all the names of the brands and companies involved in the feature so far, each day I will be writing up two/three post showing off these companies truly special Mother's day gifts. Make sure you bookmark the blog, sign up or remember to check back to not miss one post in the Mother's day feature!